A snapshot of the stellar life cycle has been captured in a new portrait from NASA's Chandra X-ray Observatory and the Smithsonian's Submillimeter Array (SMA). 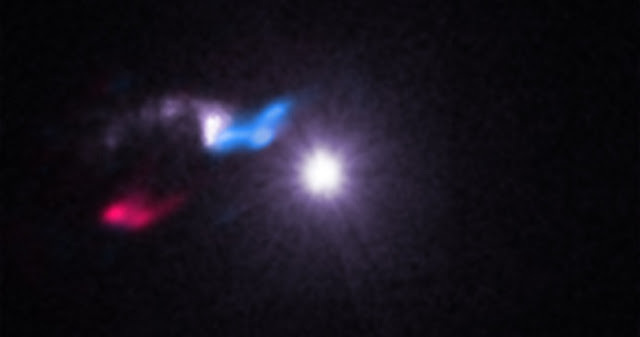 A cloud that is giving birth to stars has been observed to reflect X-rays from Cygnus X-3, a source of X-rays produced by a system where a massive star is slowly being eaten by its companion black hole or neutron star. This discovery provides a new way to study how stars form. In 2003, astronomers used Chandra's high-resolution X-ray vision to find a mysterious source of X-ray emission located very close to Cygnus X-3. The separation of these two sources on the sky is equivalent to the width of a penny at a distance of 830 feet away. In 2013, astronomers reported that the new source is a cloud of gas and dust. In astronomical terms, this cloud is rather small – about 0.7 light years in diameter. Astronomers realized that this cloud was acting as a mirror, reflecting some of the X-rays generated by Cygnus X-3 towards Earth. "We nicknamed this object the 'Little Friend' because it is a faint source of X-rays next to a very bright source that showed similar X-ray variations," said Michael McCollough of the Harvard-Smithsonian Center for Astrophysics (CfA) in Cambridge, Massachusetts, who led the most recent study of this system. The Chandra observations reported in 2013 suggested that the Little Friend had a mass between two and 24 times that of the Sun. This suggested that the cloud was a "Bok globule," a small dense cloud where infant stars can be born. However, more evidence was needed. To determine the nature of the Little Friend, astronomers used the SMA, a series of eight radio dishes atop Mauna Kea in Hawaii. The SMA found molecules of carbon monoxide, an important clue that the Little Friend is indeed a Bok globule. Also, the SMA data reveals the presence of a jet or outflow within the Little Friend, an indication that a star has started to form inside. "Typically, astronomers study Bok globules by looking at the visible light they block or the radio emission they produce," said co-author Lia Corrales of the Massachusetts Institute of Technology in Cambridge, Mass. "With the Little Friend, we can examine this interstellar cocoon in a new way using X-rays – the first time we have ever been able to do this with a Bok globule." At an estimated distance of almost 20,000 light years from Earth, the Little Friend is also the most distant Bok globule yet seen. The properties of Cygnus X-3 and its proximity to the Little Friend also give an opportunity to make a precise distance measurement – something that is often very difficult in astronomy. Since the early 1970s, astronomers have observed a regular 4.8-hour variation in the X-rays from Cygnus X-3. The Little Friend, acting as an X-ray mirror, shows the same variation, but slightly delayed because the path the reflected X-rays take is longer than a straight line from Cygnus X-3 to Earth. By measuring the delay time in the periodic variation between Cygnus X-3 and the Little Friend, astronomers were able to calculate the distance from Earth to Cygnus X-3 of about 24,000 light years. Because Cygnus X-3 contains a massive, short-lived star, scientists think it must have originated in a region of the Galaxy where stars are still likely to be forming. These regions are only found in the Milky Way's spiral arms. However, Cygnus X-3 is located outside any of the Milky Way's spiral arms. "In some ways it's a surprise that we find Cygnus X-3 where we do," said co-author Michael Dunham of CfA and the State University of New York at Fredonia. "We realized something rather unusual needed to happen during its early years to send it on a wild ride." The researchers suggest that the supernova explosion that formed either the black hole or neutron star in Cygnus X-3 kicked the binary system away from its original birthplace. Assuming that Cygnus X-3 and the Little Friend formed near each other, they estimate that Cygnus X-3 must have been thrown out at speeds between 400,000 and 2 million miles per hour. A paper describing these results appeared in a recent issue of The Astrophysical Journal Letters and is available online.